Sinister (2012), R, 110 minutes - File this film under 'movies I incorrectly assumed were too gory for my taste and subsequently ignored'. My interest in this film was actually piqued in recent months after writer/directer Scott Derrickson was announced as the director for Marvel's Doctor Strange film (being released November 2016). I wasn't very familiar with any of his previous work aside from being underwhelmed by 2008's remake of The Day the Earth Stood Still. The majority of his filmography appears to be comprised of the horror/thriller genre, so I thought I'd finally give Sinister a shot. Ellison Oswalt (Ethan Hawke) is a true-crime author who is years removed from his one best-selling novel. He and his family are moving into a new home in a new town. Oswalt likes to get as close as possible to the crimes that he is researching and writing about but this time around, unbeknownst to his wife and kids, he has moved them into the actual house at which the current case he is writing about occurred (a family of four was hung from a tree in the back yard while the lone surviving daughter had gone missing). The local Sheriff (Fred Dalton Thompson) even pays them a visit on move-in day to let Oswalt know that he doesn't approve of Ellison's methods and that no help from the local police department will be available to him. As the family unpacks and begins to get settled in their new home, Ellison finds and old box full of Super 8 reels and a projector in the attic. As he begins watching them, he discovers that they are recordings of a number of similar murders. He believes he's uncovered the works of a serial killer and that if he can crack the cases, they will lead to be his next big literary hit. What he doesn't realize until much later is that something much more sinister (no pun intended) and supernatural is afoot. While there are a handful of disturbing murders that we see bits of as Ellison watches the old Super 8 reels, there really isn't anything terribly gory or graphic for an R rated film in this movie. It is a good mystery, with some supernatural elements, and a couple of scenes that will jolt you out of your seat. The story primarily revolves around Ethan Hawke's Ellison and his research of the crimes, but his family members - wife Tracy (Juliet Rylance), son Trevor (Michael Hall D'Addario), and daughter Ashley (Clare Foley) also play an important role, as do two primary consultants: Deputy So-and-So (James Ransone), who helps Ellison against his Sheriff's wishes, and Professor Jonas (Vincent D'Onofrio) who actually helps Ellison determine that darker forces may be involved. Sinister is a pretty decent horror/supernatural thriller and apparently was successful enough that a sequel was released this past fall. 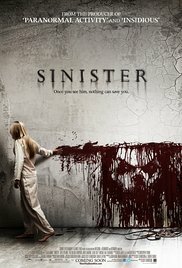 I'm mildly curious to see what direction Sinister II goes in considering the events at the end of this film. I may need to track it down as a rental when it gets a dvd/blu-ray/digital release as at least one character carries over according to the credits on imdb.com. If you've followed this blog space at all over the last year and a half or so, you know that I've been a huge supporter of Charles Soule's recently completed Daredevil run. The eighth and final trade paperback was released this past week, so now that it has been collected in its entirety I thought I'd try and do something fun in an effort to spread the love. The New Teen Titans Omnibus Vol. 3 (New Edition): Collecting Tales of the Teen Titans (1984) #42-68, Annual 3, and The New Teen Titans (1984) #1-9. My last review was for volume two of this series of omnibi and I enjoyed it so much that instead of taking a break for something else, I dove right into volume three (just released last month), and boy am I glad I did. This volume covers two of the best story arcs from the creative team of Marv Wolfman and George Pérez that I have read, beginning with the classically acclaimed The Judas Contract and then later The Terror of Trigon (Pérez's last contribution to the title before a few year hiatus). I had minimal passing knowledge of the events of both arcs thanks to their loose adaptations in the Teen Titans animated series that ran from 2003-2006, but these original versions prove to be masterfully crafted. The Marv Wolfman/George Pérez run on The New Teen Titans has long been one that I really wanted to check out. Until recent years my reading had always skewed towards Marvel, but I had repeatedly heard how good this particular run was supposed to be. I missed the boat when this volume was originally released years ago and seriously considered trying to pick it up on a number of occasions (and its subsequent volumes) after the fact. Then I learned about the steel trap bindings and the odd issue gaps in the original trio of books. Thankfully, DC began a series of new editions of these volumes and I jumped in on the ground floor for this new set. Here's hoping to corrected issue inclusion in the upcoming volumes, because I enjoyed the hell out of this first volume.